The REVIT Liquid Cooling Vest is revolution in keeping you cool in the saddle. Everyone knows that when you overheat bad things happen and keeping yourself alert and functioning when traveling down the road on two wheels is paramount to preventing a crash. The Liquid Cooling Vest works by utilizing Hyperkewl technology, which works by absorbing and storing water, and then releasing it over time through the naturally cooling evaporative process, keeping you cool and in control. 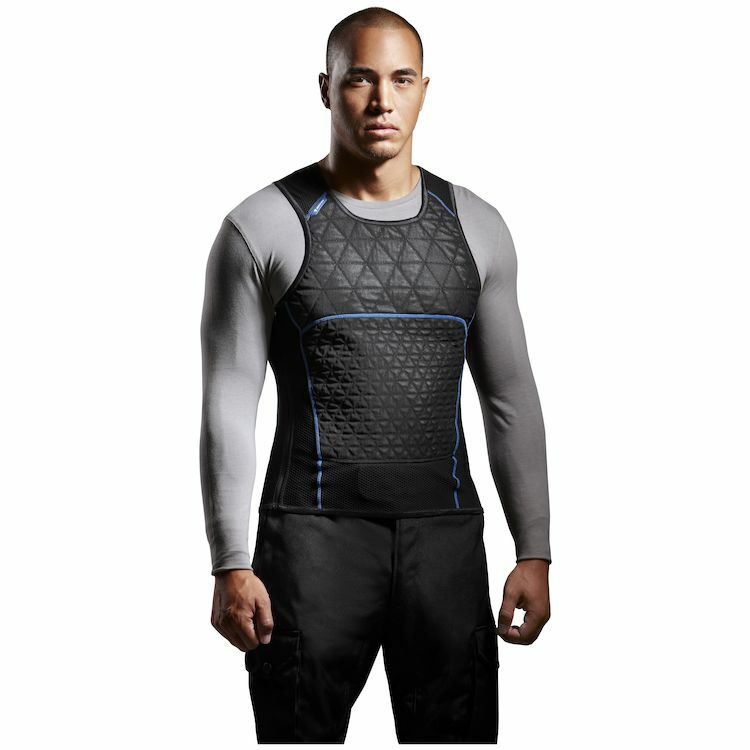 Designed specifically to be used with a highly ventilated or mesh jacket for maximum results, the vest will stay active for approximately 6 hours. To try and stay cool while doing summer riding. Summertime heat at work, I need cooling down. Bought it for summer commutes. Wasn't worth it, a $2 ice pack works better. Tried a cheaper brand - it worked great. OK I'll go with my standard class brand "Revit"
First purchase of a motorcycle cooling vest. Internet research indicated this may the best choice, features, closure, reviews. Video helped. Works very well. Impossible to imagine driving in 80 degrees and above without this cooling vest. Live in a hot weather place, so i'm hoping this vest helps with the heat. It hot riding deserts from Indio, CA to San Antonio, TX, the vest is the coolest. Perfect for hot days on Summer roadtrips. It keeps you cool without wetting you. The zipper is a bit weak. Wish it was a tad longer (i'm 6ft). On super hot days, I'm soaking this down a few times a day. To stay cool on our x-country trip this summer. friend recommended this for desert summer rides. We shall see! Riding to Tucson AZ from West Virginia, early next year. Wanted to have some sort of cooling capability available while crossing Texas, New Mexico and Arizona. Chose this based on other product reviews. I need something to keep me cooler on long rides in 80F+ weather. Will report back on how I think it does. I live and ride in TX!!! How much does it waigth? BEST ANSWER: It is very light. I normally wear a 2XL jacket and I got a XL Rev'it cooling vest. It fits snuggle which helps transfer cooling to you and heat into the vest. I like it very much. I have had other cooling vest which were heavy and more insulating than cooling. This is the best so far. I can't give you an actual weight, but I don't notice the extra weight when I'm wearing it. I wear one of those nylon shirts underneath and usually use it dirt biking so I have body armor over it. But the nylon shirt prevents me from feeling too clammy. Very light. About as much as two t- shirts when dry. Fits in a large plastic bag. The weight when wet depends on how much you soak it. I can't tell you the scale weight, but it's light enough that you don't notice it after a few minutes. It is super lite. Maybe 8oz dry. When soaked.....maybe 3lbs tops. Did anyone ruse tho product off road? in really dusty and hot conditions? will it work on slow technical single trails? I have used other products (661 core cooler and EVS cooling shirt) they work ok. Thank you! BEST ANSWER: I live 2 km on a dirt road and it feels like the slower you go the less it works. The zipper is also a problem I have stitched over the top of the zipper to seal it up. I prefer pulling the vest over my head. Must have a riding jacket that ventilates the air well. Yes it does work and I like it but you probably will get frustrated. Thanks! seems all these products don't last as long as they are supposed to. How so you Wash ir? BEST ANSWER: I washed it in the washing machine on warm/normal.. I think it worked better after.. I did it with Woolite. "Safely soaks fine washables in 3 minutes"
So far I haven't needed to. Just rinse it and let it hang dry. Will this vest work well with a klim overland jacket? The vents appear to be more on the sides and might not allow wind to contact the vest directly. BEST ANSWER: Hello. Well, i'm not familiar with a klim overland jacket. But is the airflow goes through the sides...i guess it will be less effective. I use it with an astars air jacket and it helps a little, however, if i ride after 10am is still hot. For a women's fit for this jacket - chest size 39 would it be wise to get the small or the medium? BEST ANSWER: I have a XL for a 42" chest and it fits perfectly, I normally wear large, so it appears to run on the small side. I wouldn't go any smaller than a medium and maybe look at a large. Probably a small. You want somewhat of a snug fit to help the vest. Make sure to have a thin, wicking underlayer. That's only a guess on my part. I'd recommend for this item to try first going smaller. A snugger fit provides better cooling effect. Would this work well as a Massage Therapist to keep me cool while working in clients? BEST ANSWER: This vest cools through the evaporation process. It really requires airflow to work. I suppose a fan blowing on you would do the trick. Also, works much better in a low humidity environment. It wotks okay in the south east, it rocks in Arizona! You need airflow over the vest to have the cooling effect. You would need a fan hitting you while working. IS this vest packable or is it bulky when packed away? BEST ANSWER: slightly bulky when packed like an inflated tube sock in size if folded and rolled up. The vest is very packable. Not as thick as you think. I RIDE IN LONG SLEEVE T SHIRTS DURING THE HOT TEXAS SUMMERS. WOULD YOU WEAR THIS OVER THE T SHIRT AND NOTHING OVER IT?? Texas has humid summers and as long as your riding distance are short to moderate, that should work well. For longer distances or drier climes, there would be a tendency for the vest to dry out too quickly (and maybe give you too much evaporative cooling early on). Alternately, you can put the vest against your skin and wear the t-shirt over it but be forewarned that, at least at first, it will be a bit clammy. Personally, I wear a mesh jacket. I imagine it may dry out faster if just worn over a shirt than if it was worn under a jacket. Wouldn't be that big a deal. You would just have to re-wet it sooner. Hi I'm Wearing a REV'IT jacket Size 54, what will be the correct size should I get - Large or Extra-Large? I can't find the correct sizing in the Size chart. BEST ANSWER: Hi. I have not tried any rev it jacket. However, i wear size L astars jacket and bought an M size cooling vest. The M size fits a bit tight for me. L would be better for me. Thanks for the quick reply, Roberto. That's what I'm worried, if the fit is too tight, especially I have 'beer' belly. I have a 46 in chest & wear the large cooling vest. So you probably need the ex large. They are a tight fit. I have hand guards on my bike, will these still work? BEST ANSWER: The Vest worked great . But my REV'it wrist coolers didn't do much..